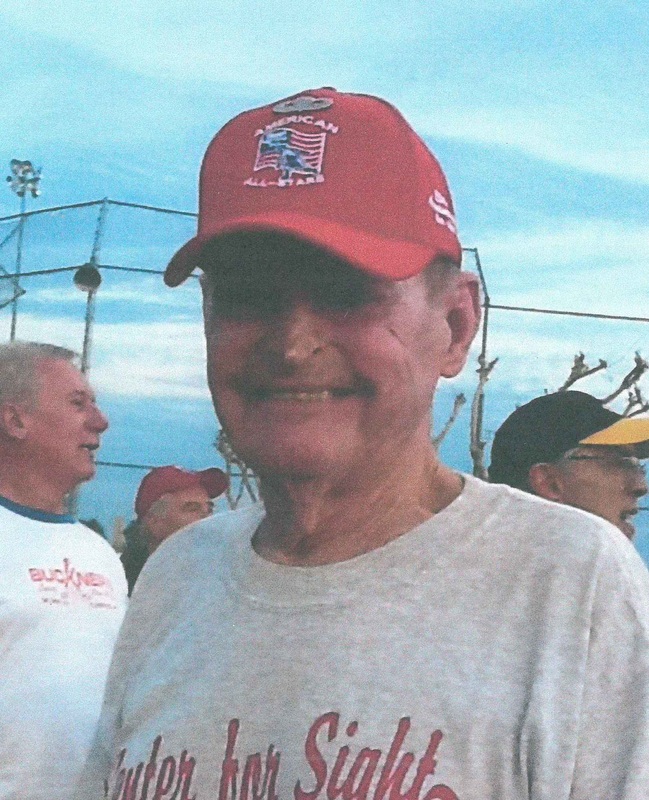 Eighty-seven Hugh Brotherton is senior softball’s answer to the Eveready Bunny, he just keeps going, going and going. It is pretty surprising for someone who never took up the game until he was 62 years old. The Brothertons have been married 64 years and in addition to their ten children, they have 23 grandchildren and 17 great-grand children, with the oldest ten years old. The Michigan native hasn’t been just a player, he has been an All-Star player. Logging most of his time with Florida’s Center For Sight team he has received so may awards and honors he doesn’t know what to do with them all. “I gave each grandchild one of my rings and still have a drawer full left,” he said. “I also have won so many MVP, All-American and All-Star Awards I can’t remember them all. What he does remember are team awards and the players he played with or against. Brotherton also proves you are never too old to try new things. A couple of years ago at the Huntsman Games he had some time before the softball tournament started so he entered some senior running events. Running in the 85-and up division he set Senior Games records in winning the 500, 1,500 and 3,00 meters. “Never tried it before but I walk three miles a day and play about 100 softball games each year, so I figured I was in pretty good shape to try it,”he said. Brotherton figures he has played well over 10,000 softball games since he started playing twenty-five years ago. The Hall-of-fame athlete also appreciates his sponsor. What changes has he seen in his twenty-five years in senior ball.? “Still haven’t figured out why the younger players need those high powered bats and ball to play, must be an ego thing,” Brotherton added. “We started with wooden and single wall bats and were still able to score runs and play the game and it was safer for the pitcher and corner infielders.”. Brotherton considers the players like himself himself who started playing in the 1990’s as Senior Softball Trailblazers. Teams from all over are anxiously awaiting the start of the SPA 2018 tournament schedule and they will not have to wait long. Alabama's LAGOON PARK starts the SPA Tournament schedule 3/15-3/18 with the SOUTHERN SPRING NATIONALS in Montgomery. Last year 37 teams attended the event as SPA tournament attendance was up across the board. "We set records last year for tournament attendance with most drawing 30 teams, six in the 40's and THEE BUCKEYE CLASSIC with 76." SPA President and CEO Ridge Hooks said. "This year we expect to continue to grow with over 30 men's tournaments and six women's. We are now in 17 states with a possibility of two new states yet to join." Ohio has the most tournaments with six with Texas, Alabama and North Carolina each having three. Tennessee, Virginia, Georgia, Florida and Missouri have two events while Louisiana, Oklahoma, Minnesota, Maryland, Illinois and Indiana one. The women have two in Tennessee and Florida with one in Georgia and Indiana. 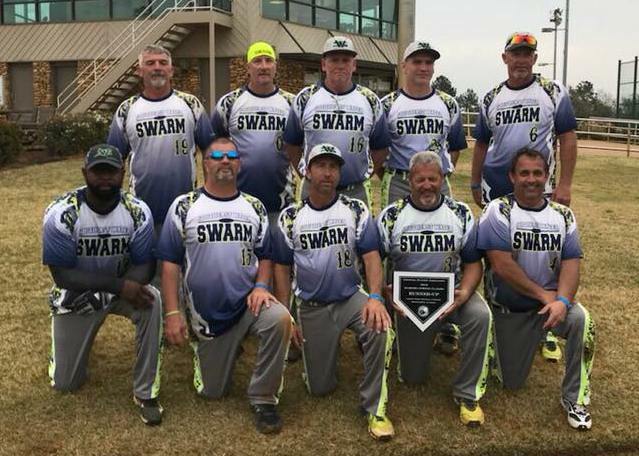 Hilton 40 Plus received on-the-job-training in their first year of senior softball and it paid off in winning the 2017 SPA 35+ Division Women’ s Worlds September 23-24 at Heritage Point Park in Dalton, Georgia. Hilton even did it the hard way losing their first bracket game and having to play nine games (3 pool, 6 bracket) to wrap up their first SPA Worlds Title. “It was a long second day,” Hilton 40 Plus and SPA 2017 35 Manager-of-the-year Ann Humble said. "This was our first Worlds and when we went 3-0 in pool, we thought we may have an easy time. Then Wham! We lose our first bracket game and have to fight our way out of the loser’s bracket." After losing 11-17 to Outer Limits in the opener, Hilton beat Arkansas Synergy 15-9, Save Second Base 21-6, Outer Limits 28-11, Pitches Be Crazy 18-10 to force the “IF” game. In the title game they led a 13-11 lead going into the seventh. PBC had two runners on and two out and their top hitter to hit a shot to LCF when LF Gretchen Gruber raced over to make the game saving last out catch. The way the season ended for Hilton 40 Plus was not the way it started. “We knew absolutely nothing about the rules or even the bats and we learned on the fly,” Humble said. Hilton went into the Pensacola Tournament with regular bats, it was the first they ever saw a Miken, but the next tournament they bought a pair. They didn’t know your age division is based on the youngest player on the roster. Loaded with 50’s and 60’s players they were expecting to play at least 55’s...until they were told one of their players was 38 years young and they would have to play 35. Other surprises were the double home plate, courtesy runners and 5-run rule. At Dalton the ladies had their “big girl pants” on having team batting average of .546 but more importantly an On Base percentage of .680. Gruber was the tournaments MVP while Karen Laymon, Kendra McDaniel, Mindy Rankin, Jackie Speacer and Bear Brooks were selected to the All-American All-Tournament team. Speacer was Hilton’s pitcher for all nine games. On the roster were: Cristina Flogerzi, Humble, Bonnie Curry, Laymon, McDaniel, Rankin, Jena Rhea, Teresa Robertson, Triska Scott, Speacer, Brooks, Daphne Beagles, Karrie Warren, Gruber, Ryann Ellingsworth and Kelly Allen. Humble also received some other good news. Apparently SPA will be holding a November 2018 tournament in Panama City, Hilton’s home area. Final Standings in the 35 Division was Hilton 40 Plus, 2. Pitches Be Crazy, 3. Outer Limits, 4. Save 2nd Base and 5. Arkansas Synergy.